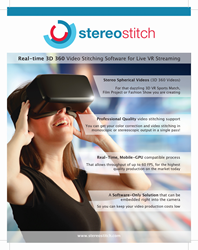 StereoStitch-Live is an easy-to-use Live 3D-360 video creation tool that generates a unique immersive experience. It will be showcased at Photokina Imaging Fair in Cologne - Germany. We are excited about providing VR content producers with an affordable high-quality solution that streams live 4K (Ultra HD) 3D video to VR headseats. Dermandar, the leading start-up in VR Video Stitching Technology will showcase StereoStitch-Live, its Live 3D-360 solution at Photokina Imaging Fair in Cologne - Germany. Currently, VR video production requires a lengthy post-production man-hours, complex equipment and powerful computers. Dermandar removes these pains by offering an easy-to-use Live 3D-360 video creation tool that generates a unique immersive experience. Beside providing a high-quality video stitching in real-time, Dermandar's video software offers additional features such as color correction and stereoscopic view in a single, mobile GPU-compatible process that can be embedded right into the camera and makes video production costs low. "We are excited about providing VR content producers with an affordable high-quality solution that streams live 4K (Ultra HD) 3D video to VR headseats" said Elie-Grégoire Khoury, CEO and Co-founder of Dermandar. He also added "StereoStitch is the result of 10 years of computational imaging research and development. Therefore, it is a cutting-edge solution for a wide range of businesses, specially the entertainment and media sectors". For a live demo of StereoStitch-Live, you are invited to visit Booth A047 - Hall 9.1 at Photokina Imaging Fair in Cologne - Germany. More information can be found on the website (http://www.stereostitch.com/), or send your request at: info(at)stereostitch(dot)com.